2015 began with me dressed as Wonder Woman on the beach and ended with NPR declaring "Year of the Period"
Excerpted with permission from "Periods Gone Public" by Jennifer Weiss-Wolf. Copyright 2017, Arcade Publishing, an imprint of Skyhorse Publishing, Inc. Available for purchase on Amazon, Barnes & Noble and IndieBound. Menstruation is having its moment. Surfing the crimson wave of fame, so the period slang goes. I’m actually a bit of a latecomer to the conversation. It wasn’t that I previously avoided or had any particular aversion to it. As a mom of three teens, I’m open and pragmatic about everything they need to know. With friends, I am quick to commiserate over a menstrual mishap. I’ll gladly lend or borrow a tampon when the moment calls for it. But periods as a matter of political discourse? The driver of a policy agenda? Period feminism? Quite honestly, not ideas I’d ever seriously entertained or even imagined. That changed on January 1, 2015. As the New Year dawned, I felt in need of extra momentum, aiming for as much potential and purpose as I could muster. And so I trekked to Coney Island, Brooklyn with a cohort of friends (and hundreds of others) crazy enough to take a dip in the icy Atlantic Ocean. The Polar Bear Club New Year’s Day swim is one of New York City’s finest traditions — a raucous scene and freezing cold mishmash of quirkily costumed, skin-baring revelers. We took the plunge doing our very best Wonder Woman impersonations, four middle-aged women decked out in matching star-spangled swimsuits, wrist cuffs, and capes. I’ve always secretly revered the Amazonian warrior. (True fact: I hyphenated my name when I got married so I could claim the initials “WW.”) The superhero theme was absolutely part of the adrenaline-driven sprint into the sea that Peggy described. We shivered, even shimmered after a full body dousing with golden glitter, courtesy of a pack of urban mermaids in drag whose towels were parked next to ours on the beach. I was immediately captivated—and honestly, even mildly ashamed that I’d never, ever considered this before. If periods could be a hassle for me, someone with the means to have a fully stocked supply of tampons, it was nakedly, painfully obvious that for those who are poor, or young, or otherwise marginalized, menstruation could easily pose a real obstacle and problem. A self-aware, self-professed feminist, how had I managed to completely overlook this most basic issue? I had to know more. And so, spent the rest of New Year’s Day obsessively scouring the Internet to see what I could find. Here’s what my Google search on the first day of 2015 turned up: It took some digging, but there was indeed reporting about the lack of access to menstrual products and adequate hygiene facilities in countries like India, Nepal, Kenya, Bangladesh, and other places—enough so that it had been recognized as a public health and human rights issue by the United Nations and the World Health Organization. The key culprits named included extreme poverty, lack of health education and sanitation, and an enduring culture of taboo and shame. Stories of creative enterprise and innovation to tackle this problem were prevalent, too. As for any systematic attention to the scope of this issue as a domestic matter? None at all. What I unearthed amounted only to an occasional blog post or lone call for donations by a local shelter or food pantry. Nothing that attempted to narrate, quantify, or formally document the potential problem, or—more disappointingly—even sought to identify or acknowledge it as one. During the months that followed, my interest swelled. Truly, this issue struck me as one of the most vital outlets for my energy and skills—as a writer, lawyer, policy wonk, feminist, even as a mother. By day, my job at the Brennan Center for Justice, a think tank affiliated with New York University School of Law, had me contemplating the mechanics of achieving legal and democratic change in America. After hours, I kept reflecting on menstruation, placing it squarely in the context of social justice, civic participation, and gender equity. Before long, I began to connect with journalists, lawmakers, activists, and entrepreneurs, and found myself entrenched in a growing global network of people who were equally intrigued and motivated by the power of periods. Today the landscape looks remarkably different. We’ve gone from zero to sixty, periods as a whisper or insult to the initiation of a full-blown, ready-for-prime-time menstrual movement. And thus unlocking a radical secret: half the population menstruates! There really are ways to address periods that are practical, proactive, and even political. In so doing, somehow we have achieved a level of discourse that has otherwise eluded society for nearly all of time. Periods have indeed gone public. And with that, so too has my own story crystallized. I now believe unequivocally in the sheer sway of menstruation as a mobilizing force, so much so it has turned my world upside down. 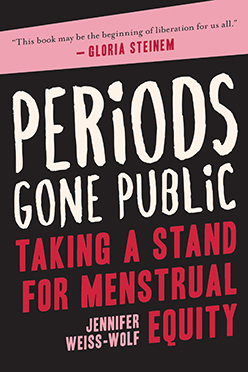 I have spent the last few years crisscrossing the globe to discuss menstruation with lawmakers and innovators, testify before legislatures, brief reporters and editors, speak at universities, and shout into megaphones at rallies. I’ve written op-eds and essays on the topic, even drafted model bills. I’ve met and joined forces with a diverse array of inspiring activists from Mumbai to Nairobi, London to Kathmandu, and New York City to Los Angeles. Wonder Woman herself even came home to roost. Since that fateful New Year’s Day, I scored my own, admittedly oddball, alter ego and fighting persona. According to New York magazine, I morphed into the nation’s “tampon crusader.” Bustle went with “badass menstrual activist.” Tweeted at by the editors at Cosmo: “slayer of the tampon tax.” Slayer! Damn. Even my kids were impressed. It has come together under an umbrella I call “menstrual equity.” And what I mean by the phrase is this: In order to have a fully equitable and participatory society, we must have laws and policies that ensure menstrual products are safe and affordable and available for those who need them. The ability to access these items affects a person’s freedom to work and study, to be healthy, and to participate in daily life with basic dignity. And if access is compromised, whether by poverty or stigma or lack of education and resources, it is in all of our interests to ensure those needs are met. The inaugural political fights for menstrual equity in the United States thus far have been the push to eliminate sales tax on menstrual products (a.k.a. the “tampon tax”) and to ensure they are freely accessible to those most in need—low-income students, the homeless, the incarcerated. These campaigns have seen early success with surprisingly robust bipartisan support and interest. But that is only the beginning. A truly comprehensive menstrual equity agenda would eventually drive or help reframe policies that foster full participation and engagement in civic society—and that accept, even elevate, the reality of how menstruating bodies function. The need for such perspective is increasingly urgent given today’s treacherous political environment. “The Year of the Period” is now saddled with the misogyny of and daily danger unleashed in the era of Trump. This American president, who has a history of openly bragging about sexual dominance—caught on tape boasting crassly how he’d grab women “by the p**sy”—singled out menstruation for a special dose of derision early in the 2016 campaign when he taunted then FOX News correspondent Megyn Kelly for having “blood coming out of her wherever.” The administration and current Congress remain hell-bent on trampling hard won protections for civil rights and reproductive freedom. Many statehouses, too, are emboldened to advance laws that profoundly compromise our health and bodily autonomy. The fact that we’ve begun to coalesce a successful movement around menstruation may be but one bit of hope—new blood (literally!) and momentum in the greater fight for our lives. My activism has also led me to two issues that I hadn’t fully appreciated previously. First, the impact of menstruation on those who are transgender or gender nonconforming, and the default culture of their exclusion from the conversation. It is a challenge, given that the vast majority of people who have periods are cisgender women and girls, as well as that so much of menstrual taboo is rooted in ages-old misogyny. Ultimately, though, everyone and anyone who menstruates needs to be included in discussions and decisions about their own health. The other is environmental—in particular, balancing the dangers of our nation’s throwaway culture and reliance on disposable products with helping the most vulnerable populations manage menstruation. The convenience of conventional tampons and pads can’t be understated. Reusable options like menstrual cups or cloth pads are often not feasible for those without access to basics like clean water, soap, and privacy; and products made with organic or all-natural ingredients can be prohibitively expensive. But it is critical to fight for safe, eco-friendly options for all. The impact of menstrual products on our bodies—and the entire planet—is decidedly a feminist and social justice issue. At its core, a menstrual equity movement is about challenging us to face stigma head-on. And about advancing an agenda that recognizes the power, pride, and absolute normalcy of periods. Indeed, President Trump, we do have blood coming out of our wherever. Every month. It is not a secret. As for me, it has been nearly three years since Wonder Woman made her first appearance on a cold Brooklyn beach. The moral of my own story just may be: don’t ever underestimate the determination of a woman with a cape. And a tampon.